shorts and sandals, and head south to experience a little taste of Paradise! 199 Shipyard was great! Unit was recently renovated, walking distance to everything! Already booked for next year! I absolutely love everything about Key West. This condo is in the perfect location to go just about anywhere. We rented bikes which were delivered to our condo. That's about all you need unless you venture out farther. The condo has everything you need. Hello Vivian, Thank you for your feedback, we greatly appreciate it. Hope to have you stay with us again soon. Hello Jeff, Thank you! Hope you come back again soon. The condo is decorated very nice and was of the nicest places we have ever stayed at. Hello Andrew, Glad you enjoyed your stay and hope to have you stay with us again in the near future. Very clean and neat property. Hello Joel, Thank you for your feedback. Glad to hear you enjoyed your stay. 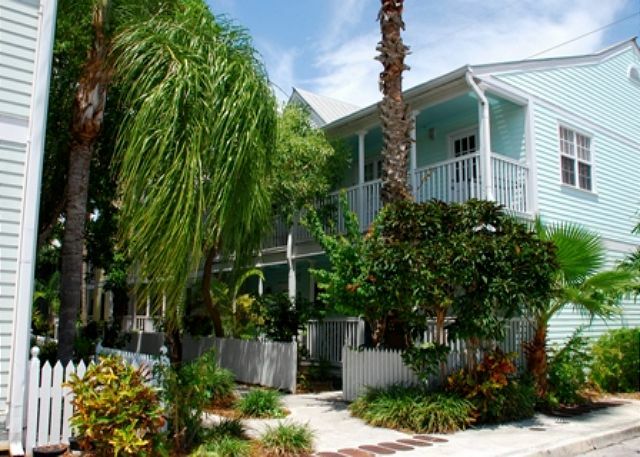 we have stayed many times in the Truman Annex and this is one of our favorites.The cond has everything you could ask for and very clean.The bed was comfortable.The Key west property and realty company was very helpful to all our requests.I would totally recommend this property . Hello Kathleen, Thank you for feedback, we are glad you enjoyed your stay. Enjoyed two weeks of tropical weather in winter without leaving the USA. Walk to everything Key West has to offer or stay in and grill on the patio then watch a movie on the big screen. Hello Mark, Glad you enjoyed your stay. Come back to see us again soon. Beautiful condo, great location. Will definitely try to book this one again. Took friends down with us for their first time in the Keys - they are believers now! Hello Susan, Thank you for your feedback, glad you enjoyed your stay and your repeat business. Condo was spotless and equipped/stocked with many essentials. We enjoyed our stay and definitely will consider this condo again in the future. Superb property, location, and rental experience. Great place to stay!!! Very convenient to everything. We walked everywhere, absolutely loved the condo. I will book this same unit again on my next trip to Key West. Hello Deborah, Thank you for your feedback! Glad you enjoyed your stay and look forward to seeing you again on your next trip. We were extremely happy with our stay at Shipyard 199. The unit has recently been updated - great kitchen, new bathroom, comfy furniture, and a modern, relaxing decor. The unit has an extended deck, which was perfect for dining outside with plenty of space to our bikes. We have rented several units in Shipyard and this is by far our favorite. We definitely plan to return to this unit on future vacations. Hello Stephanie, Thank you for your feedback we greatly appreciate it. Look forward to seeing you again in the near future. Hello John, Thank you for your feedback we greatly appreciate it. Hope to have you and your family stay with us again in the near future. Hello Art, Thank you for your review, we greatly appreciate it. Hello Mike, Glad you enjoyed your stay. Hello Michael, Glad you enjoyed your stay. Hope to have you stay with us again in the near future! The staff was very friendly and efficient. No problems with communication or misrepresentation on anything. The price was in line with other units in the Shipyard and the condo was exactly what I expected. It was very clean and well set up. A few areas need a little minor upgrading but I find that in almost all Shipyard units. It is a little smaller than the pictures might lead you to believe but that just shows they have photography skills. If it was mine I would go for smaller furniture and fewer decorations to make it seem larger. The location can't be beat. The Shipyard is private, quiet and very convenient. All in all it was a great stay and I wouldn't hesitate to rent there again. Hello Michael, Thank you for your feedback it is greatly appreciated. Glad you enjoyed your stay and hope to have you stay with us again soon. Unit was very clean and very well stocked with paper goods. The new stove, new mattress and new a/c (which is much quieter in m/b!) were much appreciated. Truman Annex great location for walking just about anywhere. Had another great week in KW! Place still needs to be updated- maybe some paint and new slipcovers? Becky at management company still great. Hello Emily, Glad you enjoyed your stay. This property will be painted in April, thank you for your feedback we greatly appreciate it. Hello Matthew, Glad you enjoyed your stay. Hope to see you again soon. Hello Michael, We are glad you enjoyed your stay. Hope to have you stay with us again. In Key West from Christmas Day to New Year's Day. Way to busy for my liking will not go at this time of the year again. Condo was great, loved the big deck, which offered a lot of privacy. Need to replace shower liner. Hello Denise, Thank you for your feedback it is greatly appreciated. Glad you enjoyed your stay and hope to have you stay with us again. had a great time. unit was smaller than anticipated, but clean and tidy. Hello Carl, Glad you had a great time. Hope to have you stay with us again soon. Thanks so much for finding me the perfect spot for me to stay in Key West. I came down for the Parrot Head Convention to raise money for my brother Fingers Taylor, who has Alzheimer's. We were very successful in our fund raising efforts. Being across the street from Blue Heaven was a perfect place to relax. We had a fund raiser at Blue Heaven for my brother and raised a lot of money! Perfect trip and stay. I will definitely use Key West Vacations and Rentals again and recommend it to friends. Hello Brent, Glad you enjoyed your stay and that your trip was a success. Hope to have you stay with us again in the future. We spent a marvelous week in Key West. The condo was perfect for us. Loved waking up to the roosters! The condo was immaculate and it was perfect for the two of us. Security was excellent as well. Parking space was quite a ways from our condo, but it appears parking in all of Key West is a horrific challenge! Hello Felice, Thank you for your feedback. Glad you enjoyed your stay and hope to have you stay with us again soon. Excellent location!! The condo itself is in definite need of an overhaul, from a good cleaning to the amenities (furniture). But with that being said, the complex itself is perfect. It is a short walk to any and everything. My family and I stayed spring break week, March 2014 and felt we got a good deal on the property considering the perfect location it's in. Don't expect a 5 star resort, but you will be in the heart of it all and that's where the deal is! Hello Russell, Glad you enjoyed your stay. The owner's will be doing upgrades to their property in the next coming months, thank you for your feedback we appreciate it. Hope to have you stay with us again in the future! This was our first time renting a property for a vacation. We were more than pleased with the location as everything was within walking distance. It was great to be able to cook our own meals and come and go as we pleased. The Annex is a safe clean and well managed complex. We will be back. Hello Lee, Glad you enjoyed your stay. Hope to have you stay with us again soon. Great Location, seemingly new condo, quiet while 2 blocks from Duval Street, who could ask for more? We enjoyed Key West as much as anywhere we have gone. Hello Jeff, Glad you enjoyed your stay. Hope to see you again soon. Wonderful week! Still wonderful location- close to beach and old town. Very clean and Becky from KWP was outstanding to work with. The furnishings need some updating but found everything comfortable and very clean. The large back deck is a gem with both sun and shade. Will be back next year! Hello Emily, Glad you enjoyed your stay. Thank you for the feedback we greatly appreciate it. See you again soon in paradise! Hello Al, Glad you enjoyed your stay with us again. Thank you for the recommendation, I will make sure an alarm is put in the property. I would have taken care of that for you during your stay. Happy New Year! It was close to walk to Duval Street and short drive or walk if you like to Fort Zachary Taylor state park for swimming at the beach. Perfect Little Cottage at the Edge of Town! Lovely little cottage! Clean and cozy space with quiet and friendly neighbors. Loved the chickens, roosters and peeps! Loved the geckos, butterlies and flowers! Perfect weather! Perfect location: short walk to Fort Jefferson Park, short walk to Duval, short walk to Mallory...... What else could you want? Can't wait to do it again! Thank you! I found paradise at "Paradise Found"! We had a very good time in Key West and found the Condo to be very clean (although) it could use a little updating, but we were so busy we only used the kitchen for breakfast once, other then snacks, so it really did not matter to us, the location was perfect!! The unit needs an upgrade - stove and microwave they are both outdated and gives the unit a poor appearance. the outdoor grill is outdated. Where is the propane? How do you get propane? Unit 299 washer overflowed into our hallway. May leave water mark on the ceiling. Water mark on bedroom ceiling. we have stayed in Unit 199 3 0r 4 times. Couch should be cleaned and broken leg repaired-or replaced. Wonderful patio for relaxing, laying in the sun or enjoying shade, breakfast or other. Fully stocked kitchen to cook any meals you may want to have. Two bedrooms were just right for the 3 of us girls, but any more would have been too much. Fine for family of 4. Perfect location to walk to everywhere in Key West or get bikes to reach the outskirts. Pool at complex is nice and close. Secured within a gated community. We loved our stay and would stay here again. Only thing missing were beach/pool towels. We loved having a washer and dryer as well. Our two grown children from CA and my husband and I spent a fabulous week in Key West during March. The location of our unit in Truman Annex was absolutely perfect. We could leave the car and walk to everything, or ride our bikes, to restaurants on Duval St., to Mallory Square, to the harbor walk, etc. The unit worked very well for us and we would stay there again. It was a little bit "tired" - broken shelving in closet, baseboard strip in kitchen loose and falling off - but things seemed clean enough and the unit was furnished attractively and comfortably. The Truman Annex cannot be beaten for location and charm. we love the outdoor deck!! we have stayed at "paradise found" several times. we have always said it is a "paradise found'. the staff at "kwvpr" has always been very helpful and professional. our coffee pot went out one morning and that afternoon a new one arrived. we especially enjoy the very large outside area, not found in very many key west condos. new patio furniture to enjoy this year was a plus. the inside though could need a little attention. some of the closet inserts were broken and the most of the outlet covers needed replaced. the deck should be power washed soon. great walking to anywhere on duval street and ft. taylor. and a designated parking space..makes this an overall wonderful value. our key west home away from home! Third stay and coming back! Management staff really friendly and very helpful! The property has the best location between Old Town and Zachary Taylor Park- great food and beautiful beach within walking distance! Patio good for "lazy" readers or sun. Furniture is very comfortable. Very clean, older unit that could use a little refreshing but that certainly doesn't keep us from coming back to Paradise Found! GOOD.BACKED TO THE LEAKED NEEDED NEW FILTER/MANINTENANCE. The best things about this condo were its location and how clean it was. Some of the rooms, like the bathroom, were small, but it was spotless. I would rather have smaller rooms that are clean! It was also a nice suprise to find everything we needed, even soaps, shampoos and a blow dryer. The kitchen also included everything necessary. The only things I would add would be some more hangers in the closets and aluminum foil in the kitchen. The worst thing about the condo was that the unit directly above us was being remodeled, so there was constant noise, starting at 7 a.m. The last two days were especially unpleasant because that unit was being repainted and the fumes were very strong. We would not have stayed there had we known that would be the case. The property management company professionals were very friendly and helpful - the entire process was seamless because of them. One small suggestion - we checked in after the office was closed and had to get our keys out of the lockbox. The numbers on the lock are tiny and almost impossible to see in the dark, very frustrating for tired travelers. Other than that, all was good. I would definately use this company again in the future. Would stay again! Good Location. Would stay again. Good location. Being in the Truman annex was really wonderful, a perfect location to the Duvall street night life, it was perfectly quiet at night, you would never suspect that Duvall street was two blocks away. The pool and the gardens were lovely and not much visited in the beautiful November weather. A real plus to this location is no vehicle needs to be rented. We rented bikes for our two week stay and were to "do Key West" with ease and pleasure. Our condo was very clean and quite comfortable, a large private deck for morning coffee in our PJ's was enjoyed very much. We have every intention of returning next year. Hello Peter, Glad you enjoyed your stay, hope to see you and your family again soon. Excellent. Will come back again. wonderful location one block from Duval St. walk to beach and other attractions.Unit small, very clean and quiet.Would come back again. Our first time in Key West and loved it. We will come back.We were quite happy with the fit our needs only being two people. The bathroom was the main drawback as it was very small, and it was the only one. We really loved the back patio area with the barbecue which we used.However we really had to scrub it down before using the grill.We had to buy a wire brush as there was nothing to clean it with. The location of the condo couldn't have been better.We could walk to everything. We never did use our car. We will use the same condo again next time. Just a brief mention on the cleaning of the place. Although it was tidy we felt it needed more time on unseen things, like in the bathroom cabinet(there were stain marks where bottles had dripped) and sticky places on the kitchen counters around some of the appliances. Outside there were cobwebs hanging near the barbecue and bushes. Hello, Thank you for your feedback, we do take all of our suggestions/concerns seriously and have addressed yours. Hope to see you again soon. Loved the condo and the location. The only tiny thing was that the security code for the parking lot gate was not very clearly defined on our paperwork. Hello, We appreciate your feedback thank you! We will address the security code on the paperwork. Come back and see us soon!!! Facilities and location are very good. It would be nice to have a second TV in one of the bedrooms. Plan to be back here again next year. Really enjoyd the new furniture on the patio. The property was almost perfect. The beds in both bedrooms however were not very good. We had expected 2 queen based on the initial description. Got 1 king, and 2 twins. That was not great but then the beds themselves were really bad. Upgrading the beds in both rooms would go a long way in making this rental perfect! Hello, I am sorry for the inconvenience witht the bedding issue, we will definitely advise the owner and address this as soon as possible. We greatly appreciate your review. Look forward to having you visit with us again in the future! We had a very relaxing stay in August 2011. Close to everything, cozy environment and charming decor. Our only disappointment was that the pool was under renovation and we had to use another one that was not quite as convenient. do expect very hard beds and no sharp knives if you want to cook. a guest from Thomasville, GA does not recommend this vacation rental. Condo had 1 wash cloth. The condo above is a monthly rental and the renters must not realize they sound as though they are stomping as they walk around or just don't care. They also hosted a Wednesday evening party which went until 3am with music blasting until 3am. We are no prudes and enjoy a party but this was beyond rude. For some reason they slammed both doors each time going in and out, couldn't understand that as we had no issue with shutting the door quietly. Throw in their barking dog to top it off. I would not recommend staying in this condo as long as the renters above are living there. This was a very pleasant place to stay. I was a perfect place to spend the little bit of "inside" time in Key West. There was a great outdoor space as well for and evening barbeque. I would definitely stay here again. the gas grill on the deck was dirty. we were planning on doing some cooking and were unable due to the condition of the grill. We had a wonderful stay at Shipyard Commons in the Truman Annex. We were centrally located near everything and rode our bikes everywhere! We enjoyed Key West so much that we will be back!! We will also stay in and/or around the Truman Annex area definitely again!! Thank you for such a wonderful experience! Great location! Everything we could need was in the condo from plenty of toilet paper to kitchen equipment. Furnishings in LR and deck were "shabby chic" but very, very comfortable so no complaints! Hope to get back next year, same place!! We loved the location of this place as well as the development and its natural beauty. We had a couple minor issues that the management company had fixed immediately. We had a great time and loved how cute the place was. Everything was better than expected. I will be back. Nice place to stay in Key West. Pool was not large but very comfortable. Only 2 blocks off Duval St & we felt very safe walking everywhere we went even though we had a car. We realy liked this unit. Very clean and well keep. It is near the pool. Close to Deval St. and Fort Zachary Taylor. We walk to each of them most every day. The only problem we had with the Unit was the A/C fan in the closet was loud. But most of the time we were so tired from having so much fun we sleep right thu the noise. We have been coming to Key West for the last 15 years. The condo is half way between the Atlantic and Gulf. Easy walking- you do not need a car. Everything is close by we walked for 3 straight weeks. Our unit was great with plenty of light and deck space. We really enjoyed our vacation. The weather was perfect, the location was great, lots to do. The patio was really nice and big and we spent most of our time out there. The only negative is that there was no where to put our clothes. We had to go out and buy hangers because there was not a single one in the place and the drawers were filled with someone else's belongings. We had to live out of suitcases. But, aside from that it was great. love the city. excellent restaurants. the rental uniy was great. nice private deck for after beach reading. will be back. Nice outdoor sitting and eating area.Needs floor scrubbing and cleaning under furniture.Old refrigerator with non working ice maker. Need to reduce clutter. Need better bikes. Need new appliances. Great location. Easy walking to most key areas. Perfect location. Close to best beach (Ft. Zachary Taylor State Park, 2 blocks to Duval, 2 blocks to great restaurant Blue Heaven. The unit is small but adequate with a very nice patio. a guest from Ada, MI does not recommend this vacation rental. This condo is very cluttered with the owner's personal stuff. There is very little closet space because they are filled with an old TV, dresser and other owner's stuff. It would be a nice place if it was de-cluttered. There is no way four people could stay here. Only downsides to the unit were that we were unable to sit on the front porch as there were 5 bicycles being stored on it and that none of the outside lights worked on the back porch. There were candles on the back porch but could have really used lighting. The kitchen was WELL stocked with utensils and glassware. Rooms were very clean as well. Check-in for the unit was on a busy saturday so we had to wait to pick up the keys. would recommend another way to maybe have everything ready for the guest upon arrival as it took us a 50 dollar cab ride from the airport to get the keys and then get to the unit. All in all we did have a great time! The location of the property was ideal, along with convenience to all spots near the area. Weather in November was great!